About a year or so ago, I went to my friend’s house and as the kids ran around and jumped in and out of the pool we sat in her back yard, chatted and caught up on each other’s lives. She laughed at me because I had grabbed my Amazon package the postman has just delivered and was opening it at her house. While I ripped at the box, she went inside and brought out little tomato tarts she had made from a recipe in the latest Donna Hay magazine. 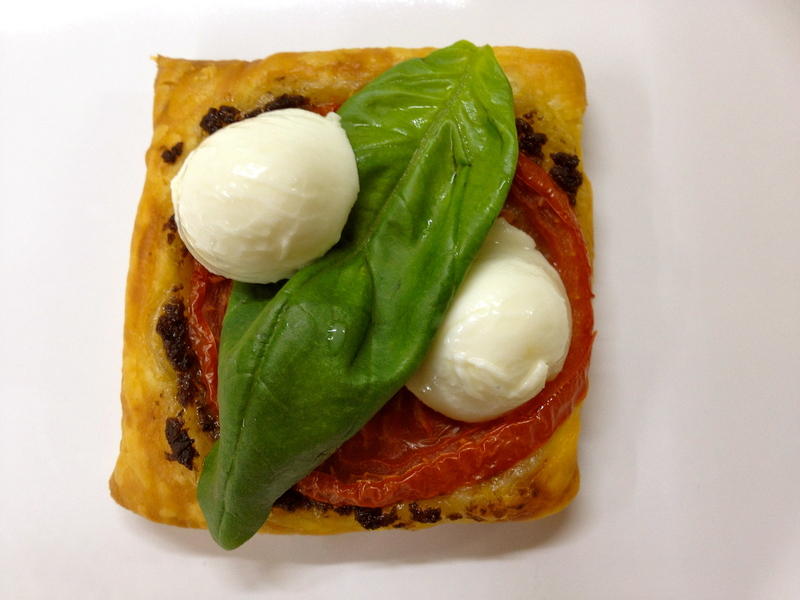 They we bite size squares of golden puff pastry topped with olive tapenade, a slice of tomato and fresh bocconcini cheese. They were so incredibly simple and delicious we ate the entire tray as we flicked through my new book, Dorie Greenspan’s ‘Around My French Table’ and she listened to my plans about joining an online cooking blog I had read about. The next day, I bought the magazine, and the ingredients, and I made the delicious little tarts for my family. They were a huge hit and I’ve been making them on a regular basis since then. They are a great after school snack! When I saw this week’s French Fridays with Dorie recipe it brought back my memories of that lazy afternoon. So much so, that I kind of went on automatic pilot mode. I didn’t follow Dorie’s instructions. They seemed a little bit complicated for something so simple. I just cut the puff pastry sheets into little squares. Smeared a dollop of black olive tapenade and put a slice of tomato on top. I baked these in the oven until golden brown. I then took them out of the oven and topped them with fresh slices of bocconcini cheese and basil leaves. I followed Dorie’s suggestion and sprinkled some balsamic vinegar on top of some of the squares and I have to admit, I loved the taste. I’m looking forward to seeing what the rest of the French Fridays with Dorie group thought of this week’s recipe. Tags: baking, cooking, food, french fridays with dorie, recipes, tarts | Permalink. What a lovely story. These little tarts really were so darn easy, I could absolutely see making these again and again. to try. Yours look great. Nice story and the perfect little nibble to share with friends! 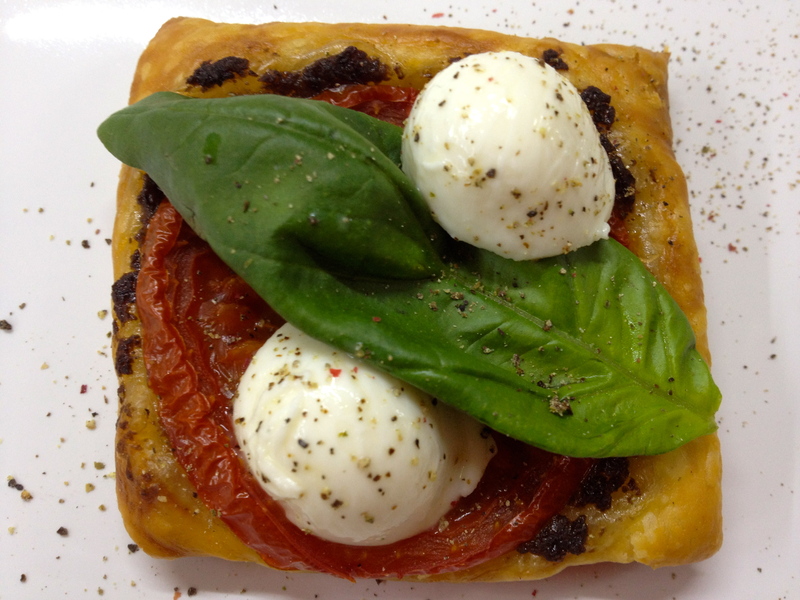 You remind me of myself with the amazon story… Beautiful tarts! Oh my, your tarts look yummy! Nice with the baked tomatoes. I thought these were good, too. We did a bit of a taste-test for different topping combinations. I kind of went square too. Your tartlets look beautiful!! Glad they brought back such nice memories. When my husband sees the post man with a box from Amazon he always says…”Christmas for Kathy”!! Have a great day! Your tartlets look fantastic! Great photos! Pretty tartlets. I love that this recipe brought back memories of first getting a copy of the book we’ve been working our way through. I was so excited when I found the delivery box on my front step! It’s hard to believe it’s been more than a year since we started.